A Review On The Kathryn Bernardo X Happy Skin Makeup Line—Is It Really Worth It? — Hey, Hershey! Hey, guys! It’s been ages since I last posted a makeup review, hasn’t it? As you ladies know, Happy Skin Cosmetics launched its youth brand Generation Happy Skin last August—and its first collection was made in collaboration with morena goddess Kathryn Bernardo! I’ve always been a fan of Happy Skin, and I love Kathryn’s glowing skin and girl-next-door charm, so this makeup collab was something I was really excited for. It's official! #KathXHappySkin is finally here!! !😍 Wanted to give you something I believe in that’s why I developed this myself with the @happyskin_ph team to empower all the girls out there with this collection. I’m a firm believer that simple is beautiful and make up shouldn’t be complicated but instead bring out the best in every girl with effortless beauty. Introducing Generation Happy Skin— a collection of must-have makeup products for the everyday girl, just like me— matte lippies, pressed powder, blush, eyebrow pen, lip & cheek tint, and mascara. They’re all long-lasting, pigmented, and fool-proof even for makeup newbies! Want first dibs? Cop it at www.happyskincosmetics.com from August 3 to 5, and get an invite to our grand launch on August 18! Hurry, limited stocks only 😉 See you there! The great thing about this line is that nothing exceeds P500! This is because Happy Skin wanted to offer quality makeup at an affordable price for the youth. Its ambassador, former teen star and now leading lady Kathryn Bernardo, was very hands on in this collaboration. A morena herself, she made sure everything in this makeup line would be flattering across all skin tones. YASSS! (Where was this makeup line when I was 16?! lol). The Perfect Brows liquid pen applies in a sheer, brown shade. It’s also sweat-proof and waterproof. This product is so long-lasting, some people even claim that this is a good dupe for the K-Palette Eyebrow Liner Pen! I honestly still haven’t gotten the hang of using brow pens yet (I prefer pencils and eyeshadow), but I like how natural it looks. Finally, a light pink shade that suits morena skintones! Fun fact: Authenticity is the ultra matte lippie shade closest to Kathryn Bernardo’s heart—in today’s digital world, it’s important to remind girls to stay true to themselves. The formula easily glides on and gives you a nice matte finish. While the shade is super cute and wearable (ang lakas niyang maka-fresh! ), the lippie will not last you an entire day, especially if you like drinking water. From experience, it didn’t even last me an hour. When you do decide to wear this lipstick, make sure to keep it in your purse so that you can re-apply every now and then. Tip: Use this on the eyes for an instant monochromatic look! Want to cop Kathryn’s signature drunk blush look? 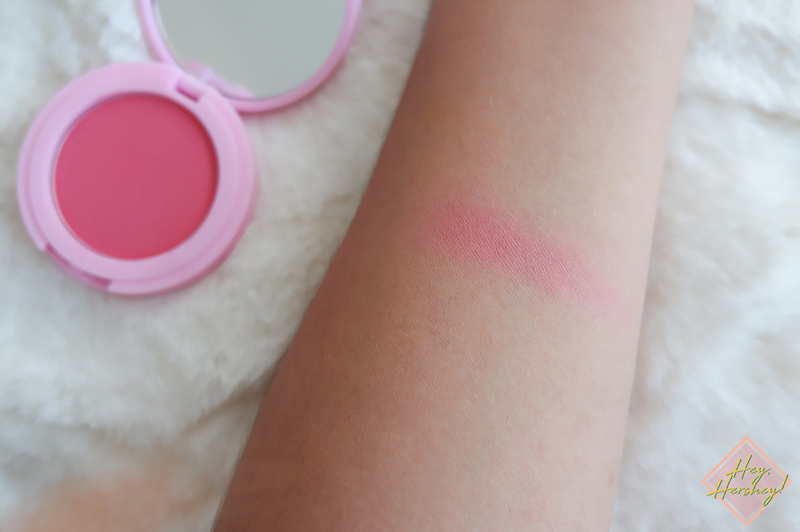 The Instant Glow long wear powder blush is a match for you! It’s buildable and highly pigmented (a little goes a loooong way! ), giving you the perfect pop of color. But honestly, I prefer orange shades over pink ones, so I’m not much of a fan of the shade Love. The Instant Glow blush Freedom looks like something I’d wear, though! You can always count on a lip tint for an instant pick-me-up. The Kiss & Bloom lip tint comes in universally flattering shades—I got one in the shade Serene, a dark pink hue. Just like the My Lips But Better ultra matte lippie, this tint is not long-lasting on the lips, too. However, it works great for the cheek and for the eyelids! I REALLY love using this as an eyeshadow (in the photos below, I dabbed the Kiss & Bloom lip tint on the edges of my eyes for some drama). On days I’m feeling laid-back, a monochromatic look using this lip tint is chic and totally office-appropriate. Disclaimer: I tried to pull off ombre lips in the pictures below, but I realized I might have done it wrong! 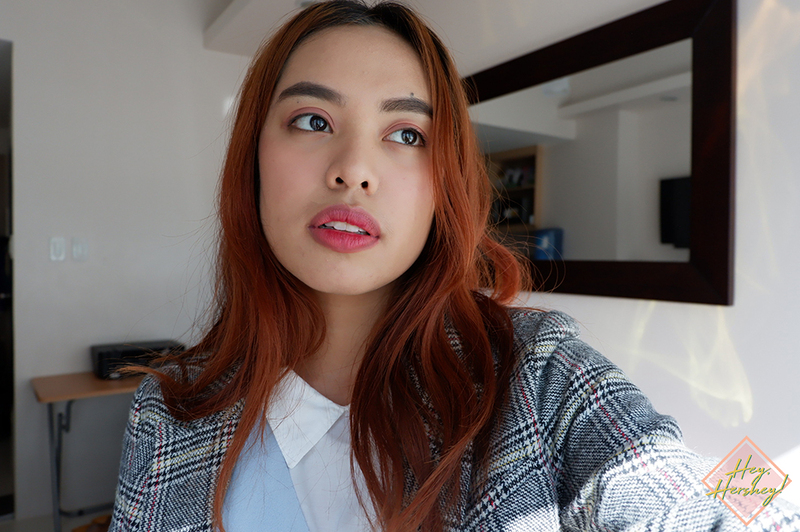 :P Instead of using just one lip tint, I applied lip tint over lipstick! I’m not sure if that’s considered blasphemy (lol), but it kinda worked naman? Haha! Finally, my favorite piece in the entire collection! The Extra Drama mascara makes your lashes look naturally long by separating each strand from one another. It also does not clump at all! The best part? It’s sweat-proof, and with its sunflower seed extract, it’s super good for your lashes! Do I recommend this line? If you’re looking for quality makeup at an affordable price, then YES, but only for certain products. I recommend the Extra Drama mascara and the Perfect Brow brow liner. I don’t recommend the My Lips But Better lipstick—while it’s really cute upon application (malakas talagang maka-fresh yung shade! ), it doesn’t last long. The Kiss & Bloom water tint is also not long-lasting on the lips—but it works pretty well on the eyelids and the cheeks. Did you like this post? Please like Hey Hershey Blog on Facebook for more posts! Let's stay connected on Youtube, Twitter, and Instagram, too!